Cheapside in 1750 with St.Mary-le-Bow church on the right. The Peace Treaty of Paris in 1763 ended the Seven Years War, leaving Britain as the world’s dominant colonial power and the strongest maritime nation. Britain also had a new, young, truly British king on the throne in George III. Improvements in farming and manufacturing techniques and growing trade with an expanding empire were increasing the wealth of many people. There was a new wave of optimism that was to last until around 1793 with the news of the French Revolution and the start of the French Revolutionary War. That thirty year period marked a high-point in Georgian confidence, vitality and culture and is known as the ‘Golden Age’. The conclusion of the war secured Britain’s trade with Canada and the West Indies to add to that of India. 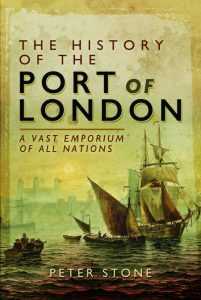 Britain’s imports and exports rose five-fold during the 18th century in what was described as the ‘Commercial Revolution’ and a large proportion of that passed through the Port of London or was dealt with by London-based merchants. Many of the sugar and tobacco plantations of the Caribbean that were worked by slave labour, making high profits, were owned by absentee landlords who lived in, or had townhouses in London. Britain was undergoing an Industrial Revolution and some of the proceeds were finding their way to the capital in the form of profits on investments or property ownership. New wealth created a growing, educated, middle class, with an appetite for entertainment and the arts. It was a time when writers such as Samuel Johnson, and Laurence Sterne, the artists Joshua Reynolds and Thomas Gainsborough and architect Robert Adam were able to thrive and produce the great work of the period. The MP Edmund Burke introduced the philosophy of the sublime. The class divide had begun to blur, with artists Alan Ramsey and Reynolds, the actor David Garrick and architect Sir William Chambers able to mix socially on an equal level with aristocrats and royalty. The eight-year old Mozart visited for a year and his earliest symphony was performed in London in 1764. It was from the middle of the 18th century that British artists became accepted as equals to those on the Continent. The most prominent, such as Allan Ramsey, Reynolds and Gainsborough, were primarily based in London. A group of them began organizing annual exhibitions, which led to the formation of the Royal Academy in 1768, with Reynolds as its first president. There was a boom in building design during the period and a broadening of styles, with many grand London mansions created for wealthy aristocrats where they could entertain other leading people of the time. The Palladian style that had become pre-eminent in previous decades was continued by William Chambers, designer of Somerset House. Henry Holland was also one of the old-school architects, as seen in his design of Dover House on Whitehall for the Duke of York and his conversion of Carlton House as a home for the Prince of Wales. At the other extreme Robert Adam and his brothers introduced a lighter, more frivolous style which they used in their large Adelphi housing development adjacent to Somerset House between the Strand and the Thames, the two creating an almost unbroken embankment. James Wyatt veered between Adam-style and Gothic, while George Dance the Younger produced buildings of a more utilitarian nature for the City of London, such as Newgate prison, and John Soane created the new Bank of England. Grand buildings of the time were often faced with the newly-developed ‘stucco’ to give the impression of being built of the more expensive stone.